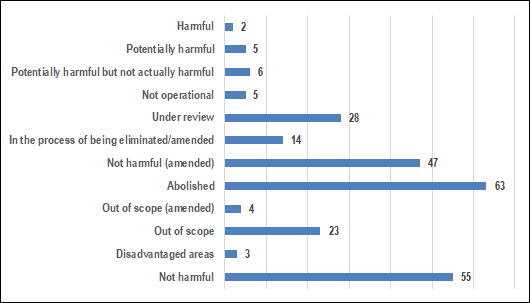 29/01/2019 - The OECD has released a new publication, Harmful Tax Practices - 2018 Progress Report on Preferential Regimes, which contains results demonstrating that jurisdictions have delivered on their commitment to comply with the standard on harmful tax practices, including ensuring that preferential regimes align taxation with substance. 44 regimes where jurisdictions have delivered on their commitment to make legislative changes to abolish or amend the regime (Antigua and Barbuda, Barbados, Belize, Botswana, Costa Rica, Curaçao, France, Jordan, Macau (China), Malaysia, Panama, Saint Lucia, Saint Vincent and the Grenadines, the Seychelles, Spain, Thailand and Uruguay). As a result, all IP regimes that were identified in the 2015 BEPS Action 5 report are now "not harmful" and consistent with the nexus approach, following the recent legislative amendments passed by France and Spain. Four other regimes have been found to be out of scope or not operational (Malaysia, the Seychelles and two regimes of Thailand), and two further commitments were given to make legislative changes to abolish or amend a regime (Malaysia and Trinidad & Tobago). One regime has been found potentially harmful but not actually harmful (Montserrat). Three regimes have been found potentially harmful (Thailand). The report also delivers on the Action 5 mandate for considering revisions or additions to the FHTP framework, including updating the criteria and guidance used in assessing preferential regimes and the resumption of application of the substantial activities factor to no or only nominal tax jurisdictions. The report concludes in setting out the next key steps for the FHTP in continuing to address harmful tax practices.